If you observe above code in header section I added some of script and css files by using those files we have a chance to display auto complete text with css style and I mentioned url field as “AutoCompleteService.asmx/GetAutoCompleteData” this mean we are calling GetAutoCompleteData method from AutoCompleteService.asmx webservice. For me its getting error in alertbox... can any one help me out? how to provide scroll bar for list of items? Sir please Guide me how to implement image slide show using jquery and web services(jquery with web services). I am getting the following error in the master pagecan u help me out to fix this. Thanks alot........So simple as to understand easily..Its working fine for me...Keep posting..
if you are using master pages the control id will be changing into a combination of you master page content place holder id and control id like "ContentPlaceHolder1_TextBox1"
For each row , the product text box should be auto complete. I AM USING THIS CODE IN MASTER PAGE BUT THIS CODE IS NOT WORKING PLZ GIVE ME LINK OR FULL CODE AUTOCOMPLITE USE IN MASTERPAGE.. I am the same person from no23. If you guys keep on hitting alert error, try this to check what is the error. Thanks for sharing the nice post. I have followed your previous post also in which you have used WebMethod instead of Web service Just out of curosity I have one doubt which will be more fatser if we compare both the ways i.e. 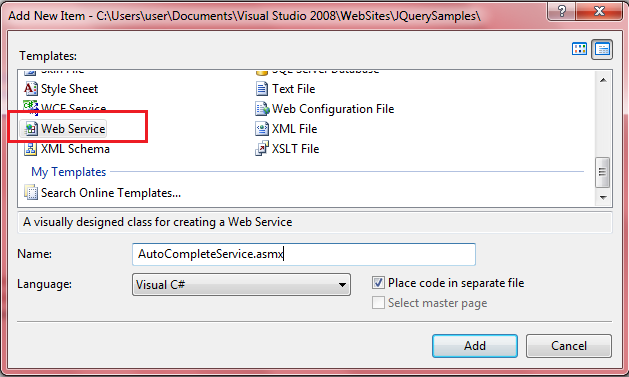 WebMethod or Webservice. How will it work for mutiple user names(first and last name) i.e with duplicate names? Very nice post, well explained. hi it is not working for asp.net text box i.e. Please I ve tried it in my index.aspx and it worked fine. But when I tried it in a page in a sub folder, it does not work. Please help me. i had done a nearly same coding for auto complete in text box. but it is not working in popup menu of text box. so please help me by giving suggestions. i had make a break point in vb page. but, page is not transferred to vb page from source. Love you yaar........... works like a charm. Which is working fine in dev environment. But published code not working in production server. (simply act as textbox) Any changes need to do ?? Help please getting this error.